Many of you may already be aware of the DIC (Download and Installation Catalogue), due to it's growing usage I thought it may be helpful to offer a support forum here at SC4D. DIC is now onto Version 2, offering new features and additional tools to hopefully make the whole process of managing your plugins a little easier. One of the main features of the DIC is the Download Manager (found via the "file" option above). From here you can keep track of all your downloaded content and install your new plugins to a specific location. Although not required to run the DIC, it works a lot better if you have both BSC Cleanitol and BSC DAT-Packer (both found on the LEX) installed. If you need additional help or support please post your queries here, or PM me if you prefer. I'll be adding additional details over the coming weeks that cover some of the other features, please let me know if you have any specific areas you would like me to cover. Thanks, David, for this post, and to Doc Rorlach & team for such a wonderful tool! ...or at least that's what I anticipate. I can't get the DIC to install properly. Sorry to be such a noob, but when I unzip the dic_release (version 2.0.1.5, downloaded directly from SC4tools website) into my SimCity folder and run the setup.exe, it begins by downloading two files; when the download for the second completes, I get an error message telling me that a new version of the Report Viewer and the install won't complete. Am I doing something wrong? Can I manually downloaded an appropriate version of the Report Viewer somewhere? Any guidance will be greatly appreciated!! The problem you encountered has to do with an error on our part. We actually eliminated the Microsoft Report Viewer from our dependecies (too buggy). To correct that we advise you to download the just released DIC version 2.0.3.4, either www.simtropolis.com/stex/details.cfm?id=24593 , or directly www.sc4tools.co.uk/sc4t_downloads.asp from our site[/url] . Once downloaded, use the Setup.EXE (not the MSI file) to run the installation. Everything should run smoothly from there. Once up and running. If you get stuck with any of the options available, please post them here so I can start putting together some tutorials to help you and the many other users who may have similar issues. 5. Improved filter behavior in the Download Manager – it now accepts dates as a custom filter thus enabling the listing of downloads obtained after a given date. 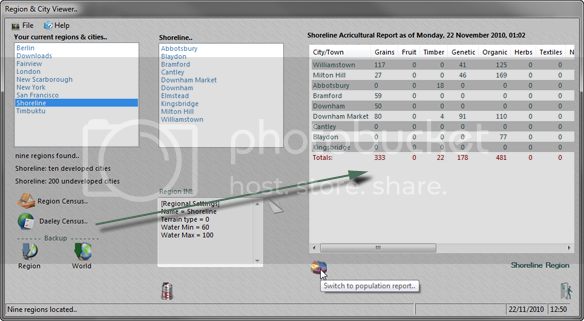 The Region & City Viewer, available from both http://www.sc4tools.co.uk our site and the http://www.simtropolis.com/stex/details.cfm?id=21392', has also received a much needed update. Foremost among the fixes is its full compatibility with Daeley's excellent Region Counter mod (available on the LEX), to show both population reports and a farming report. Both the DIC and the RCV have had a bit of a visual make-over as well. Thank you for your continuing support of one of my most loved SC4 'Tools'! There was an error with the release date of one of the previous versions of DIC, this has lead to an incorrect auto-update procedure. It would be best if you download the update directly from our site. Thanks again for sharing your awesome hard work! The "X" to close the program has been disabled to ensure DIC closes correctly. Column sorting and filtering downloads in the Download Manager for easy sequential install. Downloaded Archives found in subfolders within the DIC's default download folder are automatically categorized (using the name of the folder). Note: Only the first level within the default download folder is used - any deeper levels are ignored! During the initiall installation (or first run after an upgrade), default categories are created (but not applied), based on the in-game menus. Users can change these, of course, via the Category Maintenance available from the Developer Menu on the main DIC screen, or the Process Menu on the Download Manager screen. The easiest way to categorize is, of course, during the actual downloading: point your browser to the respective subfolder rather than the default location, and the category is automatically added. With Firefox and Chrome you can change the browsers options to ask you every time where you want to save a download. For first time users, the DIC can be downloaded from our site's download page - still the fastest method. Existing users (who have at least version 2.0) can use the Check for Updates option from the Help menu on the main DIC window. 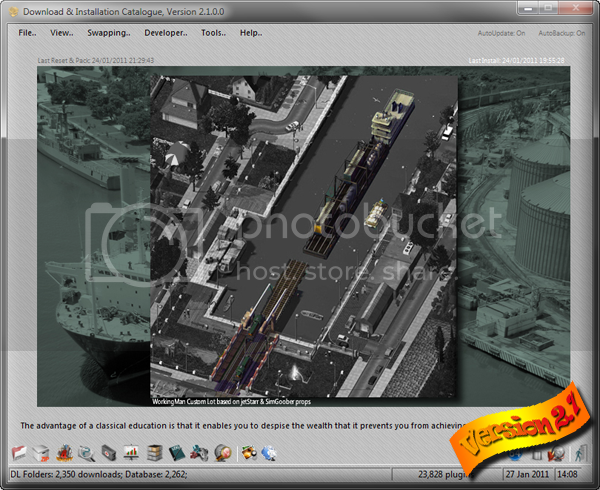 As of January 31, 2011, the SC4 Tools will be available only from our site - nowhere else. The level of support and the professionalism with which you guys handle this suite of programs is remarkable and much appreciated . In order to make categorizing downloads easier and quicker, we have now added a Category Menu. This will list, alphabetically, up to thirty categories, plus the Uncategorize option (moves downloads back into the SC4 Stuff/Downloads root folder). Also new in this version is the View Menu: it holds all sorting options plus a Unsorted option which resets the download listing to its default view (newest items first). The Logbook and Team Chart options have been moved from their original location (Downloads Menu) to this here View Menu. Plus we made a few minor fixes regard MIAs (downloads missing in action). These are now "officially" excluded from all file operations such as moving or categorizing. Users of any versions starting with 2.0 can simply use the Help Menu -> Check for Updates option to upgrade. Users of older versions will need to re-install the DIC. Both the full version and the update are also available from the SC4 Tools site. Since it had the .NET framework in it, I downloaded the newest version from Microsoft's website, this did not seem to do anything, as did reinstalling DIC. If I hit continue I can continue on in the program and use the menus/preference, etc, but the message pops up with what seems like every new click. Also the Working Mans Productions window seen in the screen shot stays frozen behind the rest of the program. If you know what the problem is and how to fix it, your help would be greatly appreciated, (I need to get my plugins folder under control). System.ArgumentException: Argument 'Length' must be greater or equal to zero. b) UAC must be turned off (set to Zero). There are simply too many file operations in the DIC to permit the use of UAC. Because UAC and DIC operate within different memory streams/threads, there will be constant collisions. Let me know if this solves your problems, if not we can then look at other areas. No luck, I am the admin, turned UAC off and tried running in pretty much every compatibly/run as admin mode possible. Same error message came up. Note that the "Argument 'Length' ... to zero" only shows up in that initial screen. All later error messages have "Object reference not set to an instance of an object" instead, and this does occur every time a new window is created within the program (click file- manage, then it pops up.) Google didn't help, only things I could find related involved coding that was way over my head. If you can't see the solution to the problem quickly don't worry about it, I don't want to waste too much of your time. Thanks again for your help. 1. Did you install the database when installing DIC? 2. Is SC4 & DIC installed in their default locaton? It would be handy to have a testtool report. I had just assumed that that was the correct install path, it sure looks like it on first glance. So if anyone else gets this problem, there is your solution. The DIC (Ver. 2.1.1.3) just had an update, available as usual via the DIC Help Menu - Check for updates, or via the SC4 Tools site. Apart from some minor fixes for stuff discovered during house-keeping, we added the Dependency Browser. This is a simple tool utilizing BSC Cleanitol™ files by scanning them for possible URLs. To use it, you must a) haveBSC Cleanitol™ installed, and b) have one or more text files listing both dependencies and their URLs. When the dialog opens it scans the Cleanitol folder for such files, listing all dependencies for which URLs exist. You can add listings by scanning other folders, and you can visit the URL by selecting it in the list and clicking the Browse button. This will display the mini-Browser below the list. The Stop button closes the browser. Note: most online file exchanges require membership and you may have to log in before you can download. Currently, the Dependency Browser does not check if you already have the listed item (planned for future releases). 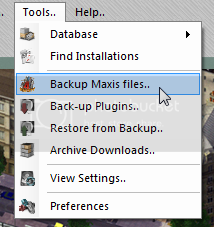 I must say this is the best tool SimCity4 has seen, and I'm amazed that you give it away. How can I send a post card of my gratitude? I had a time trying to get this to fully download from your site. Had old version but I haven't been playing SC4 much so I've started clean. Seems I was having a similar issue as previous poster. It seems the SC4 Installation path has to be pointed to the SC4 .exe, which in my case was the "C:\Program Files\Maxis\SimCity 4 Deluxe\Apps" location. Mostly wanted to say thanks for providing this tool. The latest release of DIC has had a process added to check the apps folder has been selected, hopefully this will stop anyone else having the same issue. Page created in 0.389 seconds with 103 queries.